A small handful of protesters turned up outside Google’s London HQ today to protest against the ad company’s censored search engine, developed as part of an unholy bargain to gain access to the Chinese market. The protest, which El Reg discovered a short while after its published start time, consisted of a handful of polite people standing opposite the entrance to Google’s building and peacefully holding placards. Flyers were only handed out to those who stopped and asked for them, which Montgomery admitted was because the protestors hadn’t asked the landowner’s permission to engage in flyering. She did say, however, that Google would be “facilitating censorship as an extension of the Chinese authorities” if it went ahead with its Project Dragonfly, of which more below. Perhaps unsurprisingly, Google’s London HQ appears to have been built facing a privately owned plot of land, between various new-build office blocks, that otherwise looks like public open space. This is similar to how London’s City Hall is built on private land, despite appearing otherwise. What’s Google got to do with China? 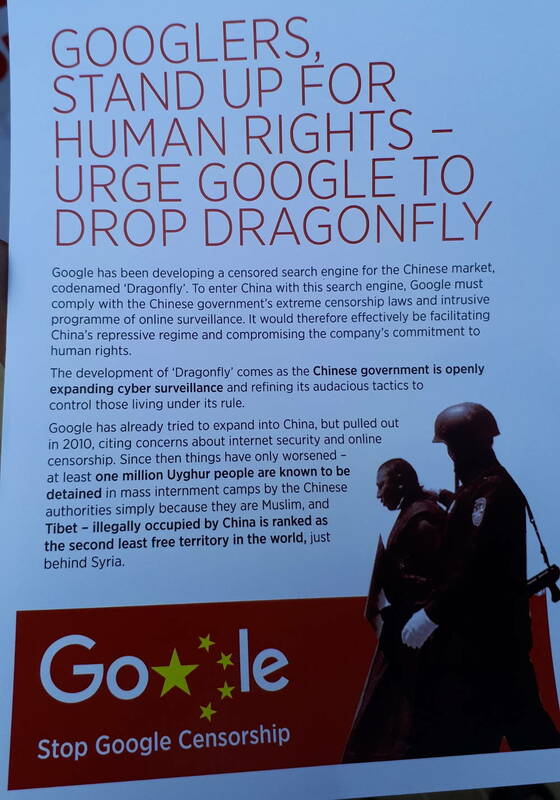 Google’s Project Dragonfly is a censored version of the Google search engine which is intended to only return results approved by China’s ruling Communist party. China, a country whose rulers are successfully bringing to life a twisted combination of the Georgian-era wet dreams of philosopher Jeremy Bentham and the nightmarish dystopian visions of George Orwell, maintains an iron grip on information available to its subjects through the power of modern IT. It also uses technology extensively as a tool of social control. Topics such as Tibet, democracy and the Tiananmen Square massacre of 1989 are strictly off limits to people in China. Protests against Project Dragonfly, which critics see as Google kowtowing to China’s ruthless authoritarianism in the eternal search for ever greater revenues and market share, have swirled in America ever since the once-secret search engine became public knowledge. In November last year, for example, a hundred Google employee signed a public letter condemning Google’s failure to cancel Project Dragonfly altogether. Chief exec Sundar Pichai said at the time that “once the furore dies down” Google will be launching a censored version of its display advertising server search engine in China.